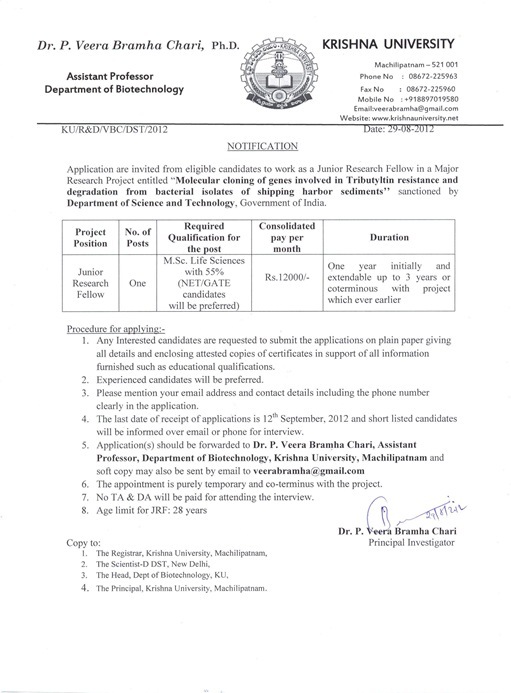 Application are invited from eligible candidates to work as a Junior Research Fellow in a Major Research Project entitled "Molecular cloning of genes involved in Tributyltin resistance and degradation from bacterial isolates of shipping harbor sediments" sanctioned by Department of Science and Technology, Government of India. 1. Any Interested candidates are requested to submit the applications on plain paper giving all details and enclosing attested copies of certificates in support of all information furnished such as educational qualifications. 2. Experienced candidates will be preferred. 3. Please mention your email address and contact details including the phone number clearly in the application. 4. The last date of receipt of applications is 12 September, 2012 and short listed candidates will be informed over email or phone for interview. 6. The appointment is purely temporary and co-terminus with the project. 7. No TA & DA will be paid for attending the interview.